William Thomas Mitchell was the third son of Thomas and Hannah Mitchell. William was born in Tamlaght, Co. Tyrone on 13th September 1894. He was one of seven children. The family lived in Coagh. His father Thomas Mitchell was a labourer. 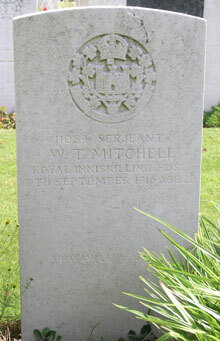 William Mitchell joined the army, volunteering in August 1914. While training at Randalstown Camp he was promoted to the rank of Corporal, finally becoming a Sergeant in June 1916. 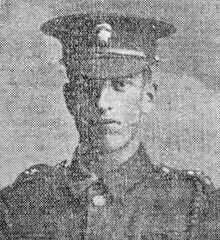 Sergeant William T Mitchell was serving with the 9th Battalion of the Royal Inniskilling Fusiliers when he was killed in action on Saturday 9th September 1916. He was shot by a German sniper whilst on duty in the trenches. Pond Farm Cemetery is located south-west of Ieper near the village of Wulvergem. From Ieper town centre follow the Rijselstraat to the roundabout at the ring road; go straight over the roundabout and follow direction for Armentieres. In the next village at the roundabout bear right in the direction of Mesen. Follow the main road straight through Wijtschate and onto Mesen. On reaching the village of Mesen, turn right at the crossroads in the direction of Wulvergem. At the crossroads in Wulvergem by the church turn right in the direction of Wijtschate. Follow this road for a short distance then take the first turning left into Vrooilandstraat. The cemetery is along here on the left.